VATICAN CITY (CNS) — Celebrating the feast of Our Lady of Guadalupe, Pope Francis described Mary as a strong woman who inspires believers to give “flesh to the Gospel” in societies often marked by distrust and blindness. “To look at the Guadalupana is to remember that the presence of the Lord always passes through those who manage to make his word flesh, who seek to embody the life of God within themselves, becoming living signs of his mercy,” Pope Francis said Dec. 12 during an evening Mass marking the feast day. 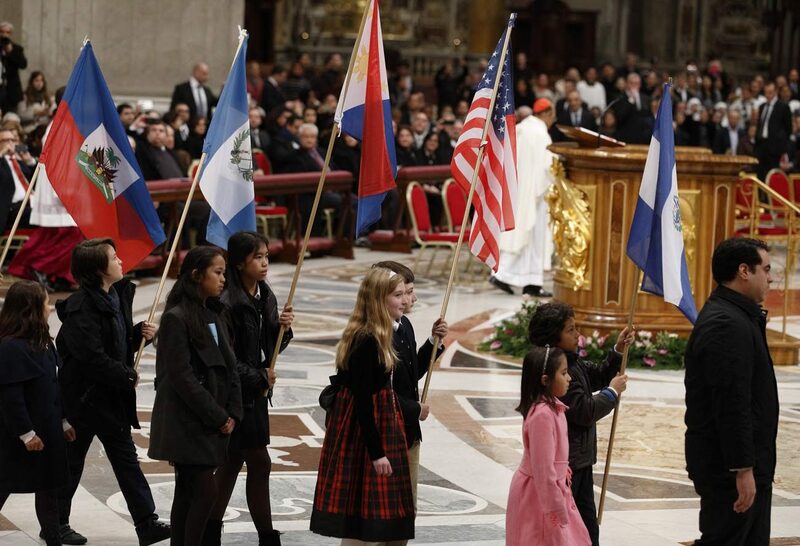 The Mass began with a procession of the flags of the nations of South, Central and North America — a sign that Our Lady of Guadalupe is patroness of the Americas. Like the U.S. bishops’ had asked their faithful to do, the pope’s Mass included a special prayer “for our Hispanic brothers and sisters and for the migrants of our lands that their dignity would be recognized and protected” and that their family unity and social and ecclesial integration would be promoted. Another prayer intention asked God, through Our Lady of Guadalupe, to end violence on the continent and guarantee “land, work and a roof” over the heads of all. The pope himself ended his homily with an improvised prayer that Our Lady of Guadalupe would intercede to give peace, bread, a home and a strong faith to all the continent’s people. The Mass was celebrated primarily in Spanish, although some of the prayers were in Portuguese and English. And the music, in addition to Latin, included Marian hymns in the indigenous Quechua, Nahuatl and Mapuche languages. “When God visits us, he leaves us restless with the healthy restlessness of those who feel they have been invited to proclaim that he lives and is in the midst of his people,” the pope said. Mary, “the first disciple and missionary,” goes out to Elizabeth to share the good news. Mary is “the icon of the disciple, of the believing and prayerful woman who knows how to accompany and encourage our faith and our hope,” the pope said. Mary’s is not a “poetically sweetened faith,” but a faith that is strong and courageous in the face of brokenness and conflict. Yet, celebrating the feast of Our Lady of Guadalupe, he said, Christians are called to remember that they have a mother — “we are not and never will be an orphaned people” — and where there is a mother, there is a strong force pushing children to behave like brothers and sisters. Celebrating the feast, he said, Christians make a commitment to proclaiming hope and trust in God’s ultimate victory and pledge to love like she loved.